“The earth is but one country, and mankind its citizens,” is one of the most famous quotes attributed to Baha’u’llah, a Persian religious leader and founder of the Bahá’í faith. 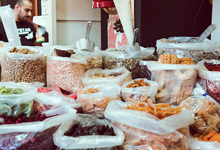 In one particular country – Israel – mankind can enjoy discovering more about one of the world’s lesser known religions. But, who are the Bahá’is? Having spun out of its predecessor religion, Bábism, the new Bahá’í faith was founded in 1863 by a Persian nobleman, Baha’u’llah, who brought a message of peace and unity and was considered by followers to be a prophet. The Bahá’í faith is a monotheistic religion focused on the unity and equality of all people and prosperity of all nations, races, creeds and classes, and it accepts the divine nature of the missions of Abraham, Moses, Zoroaster, the Buddha, Jesus and the prophet Muhammad. Once confined mostly to the Persian and Ottoman empires, today, the Bahá’í faith has grown from almost 5 million in 1986 to approaching over 7 million followers, and is one of the larger religious minorities in Iran, India, Central and Latin America, notably Panama, Belize, Bolivia, as well as Chad and Kenya in Africa. Left: Bahai Gardens Akko. Left: Bet Hatzedek building, Haifa. How did a religion born 1,500km away in Persia become connected with Israel? After being banished from Persia, Baha’u’llah was exiled to Baghdad and Constantinople before spending much of the remainder of his life in Haifa, and especially, from 1868 onwards, Akko, which was then a penal colony at the time of the Ottoman Empire. After Baha’u’llah died in Akko in 1892, the leadership of the faith fell to his son before entering a new phase after his son died in 1921. 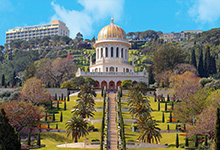 Bahá’ís around the world then annually elected local, regional, and national Spiritual Assemblies that governed the affairs of the religion and every five years, the members of all National Spiritual Assemblies elect the nine-member supreme governing institution of the worldwide Bahá’í community – the Universal House of Justice, which sits in Haifa, close to the resplendent Shrine of the Báb, for Baha’u’llah’s predecessor, and a site surrounded by the perfectly manicured Bahá’í Gardens, the jewel in Haifa’s crown and also among Israel’s most stunning and photographed attractions. Having attracted more than 7 million visitors in the decade since it opened to the public in 2001, today, the Gardens continue to pull in close to a million visitors each year and is known as one of the faith’s two holiest sites and a major place of pilgrimage for Bahá’ís, who mark festivals and holidays, including the New Year, in March, and the birth of the Báb and Baha’u’llah in October and November. Take a free guided tour to learn about the fascinating beliefs, values and spirituality of this young religion and gently walk down the 1km, 19-terrace staircase – 19 is a special number in the faith. 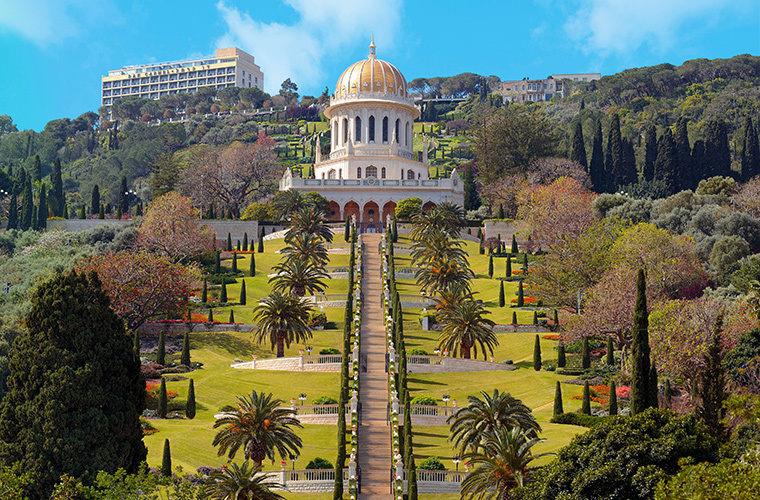 Capture special panoramic views of the manicured lawns, tended only by Bahá’ís themselves, and enjoy the golden-domed Shrine of the Báb, looking upwards towards the northern slopes of Mount Carmel and downwards, towards the impressive German Colony below. 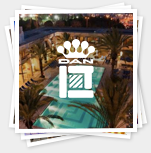 As you weave northwards via HaNassi Boulevard, you will enter the HaCarmel neighborhood containing the luxurious Dan Carmel and charming Dan Panorama Haifa. 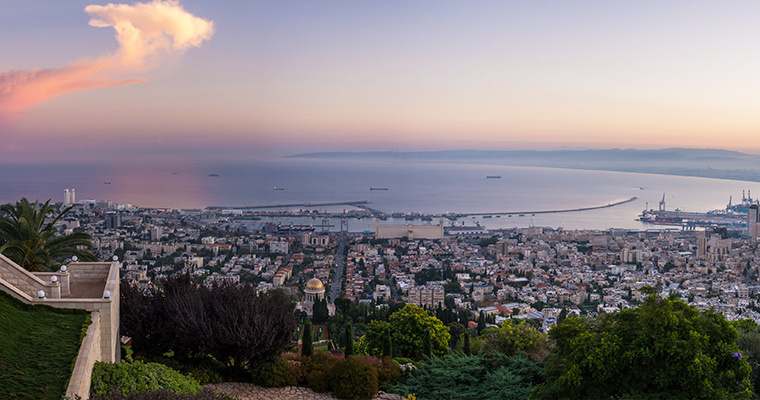 Close to Haifa is the other holiest site in the religion – the Bahá’í Gardens in the city of Akko, where Bahá’u’lláh resided during the final years of his life. It was here, in Akko, where his followers from Persia would come, often walking for a month and more, with the hope to see him. 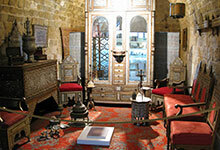 It is in the Gardens in Akko where the eventual shrine was built, and where his remains were laid to rest after he died in 1892 in the delightful Mansion of Bahji. 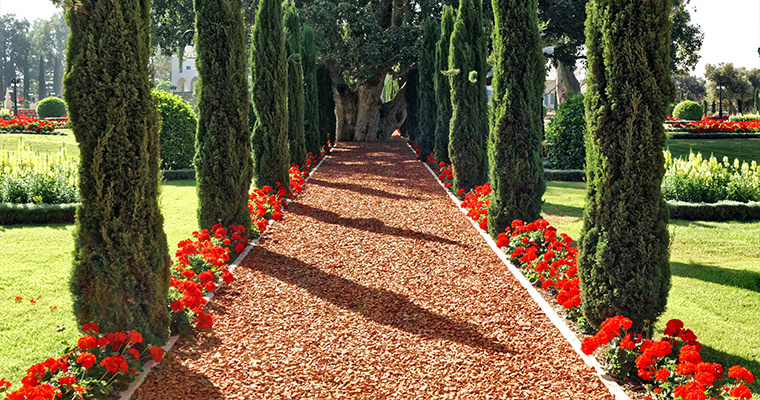 A path dotted with Cypress trees at the Bahai Gardens of Akko. Today, you can take a walk along the path, dotted with cypress trees, a centuries-old sycamore fig tree and the remains of an ancient olive grove – all helping to create a serene ambiance and a beauty that makes this Bahá’í Gardens a fascinating pilgrimage worth embarking on, into the heart of the soon-to-be less mysterious Bahá’í faith.